If you feel like a little weekend camping alongside your trusty Land Rover, the automaker offers this $185 Drifter tent by Mountain Hardware. Cars are fundamentally a source of personal transportation. But once drivers are beyond a Model T level of mobility, the selection of a car becomes a reflection of the owner. Because of this, carmakers seek every opportunity to engage in image-building, which helps cement the bond with existing customers and casts a net to gather in new ones who identify with the image being portrayed. One way carmakers burnish their image and engage customers is by selling accessories that they think their customers would like, and by licensing the use of their name on products that flatter the carmaker. Browse a company’s web site or the accessories counter at the dealer and you’ll find the typical items; ball caps, polo shirts, pens, key rings and the like. But car makers like to differentiate themselves from competitors with branded swag that really stands apart from the rest. We’ve gathered up some of the best examples of that here. Audi’s LED-lit, all-wheel-drive-propelled vehicles exude an aura of sophisticated technology, and the company sought to accentuate that with the Duo line of bicycles. 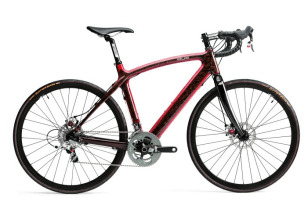 The bikes, made by Renovo Hardwood Bicycles to Audi’s specifications, are made using natural, renewable, recyclable and biodegradable wood to construct their lightweight hollow frames. The Duo Road, shown here, lists for $7,460. An ideal accessory marries brands that reflect glory on each other, and that is the case with the marriage of Bentley’s premium English luxury cars and Breitling’s sought-after Swiss watches. 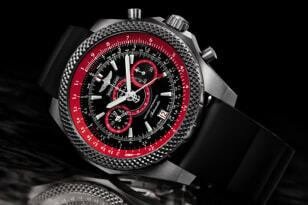 Among industry observers, “This is held up as the most successful of the watch and car company collaborations,” noted Lindsay Weaver, director of licensing and branded goods for Bentley, who worked elsewhere until joining the company last year. The most recent product of this collaboration is the Supersports Light Body watch, built to commemorate a 205 mph speed record set by a Bentley Contiental Supersports while drive on the ice of the frozen Baltic Sea. 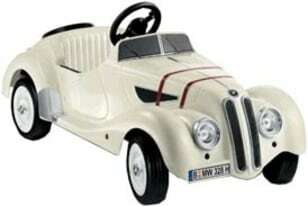 Wheeled vehicles like the 328 pedal car are a natural item for carmakers to associate with their car lines, but this one is particularly ingenious because it matches the style of a classic, and difficult to get, model that appeals to adults with pedal car fun for kids. The parent and the child both get to enjoy this pedal car, for different reasons, and at $280 it is accessibly priced. This one pretty much speaks for itself: the classic red rubber playground ball is emblazoned with the company’s name, rendering it a Dodgeball. At $9.95, customers can easily afford to plot an opportunity to drill a hapless opponent with the ball. 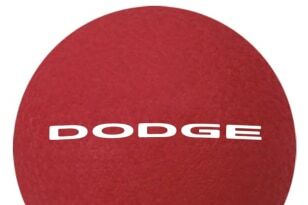 Meanwhile Dodge, the company that markets Chargers in colors such as “Plum Crazy,” “TorRed,” and “Detonator Yellow,” underscores its reputation for outrageousness that appeals to its customers. The equation is as simple as this: Ferrari = Formula One racing. The reflexive property is at work here, so it is also true that Formula One = Ferrari. The company began selling its sports cars for the sole purpose of funding the racing program, and it is the only team to have participated continuously since the foundation of the Formula One world championship after World War II. 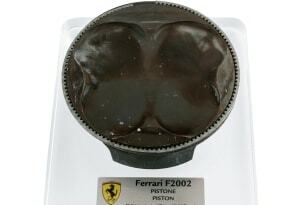 A piston from one of its Formula One race cars cements the connection between Ferrari’s racing and sports cars, giving the company an unassailable and unique connection to the Tifosi, or Ferrari fans. The list price on the company’s web site is 291.67 Euros. OK, other companies may preach excitement, but how many of them will sell you a company-branded helmet? 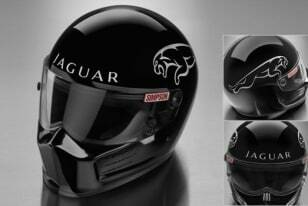 Jaguar encourages its fans to walk the walk, with this $599 Simpson race helmet. This is the distinctive-looking Super Bandit model, which promises effective venting to help you keep your cool on the track. Unfortunately, there is no available Darth Vader sound effect, so don’t hyperventilate trying to make the sound yourself. Jeep Wranglers rank up there with Labrador retrievers as bait for bringing together young singles. Following the typical outcome of such matches, active outdoorsy young moms want to stay active and maintain their Jeep credibility, even if they are driving something more infant seat-friendly than a Wrangler now. 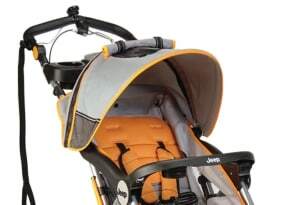 Hence the $260 Jeep-branded jogging stroller. Mercedes-Benz, the company that literally invented the automobile, could easily paint itself into the “heritage” corner as some other companies have done. Mercedes products have stayed contemporary and relevant, avoiding the industry’s retro fad of the last decade. But that history is a powerful tool for connecting with customers and differentiating the company from its competitors. 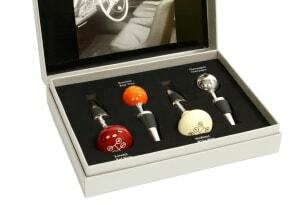 A perfect combination of heritage and everyday practicality is this set of wine stoppers, which are styled to resemble the gear shift knobs of the company’s classic models. The set of four features different colors to reflect the type of wine in the bottle. Land Rover knows you want to be an adventurous outdoorsman, even if the realities of work and family preclude much actual safari time. But that doesn’t mean you can’t at least get in a little weekend camping alongside your trusty Land Rover, using this $185 Drifter tent by Mountain Hardware. 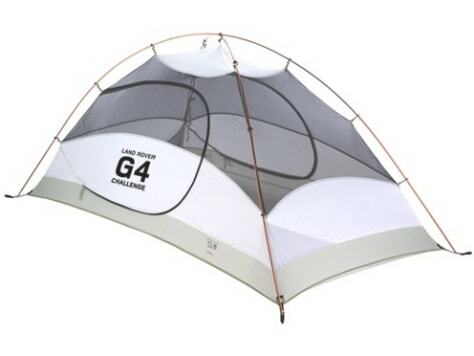 In addition to some of the typical features, this tent has color-coded poles and grommet tabs, with reflective starter points, making set-up a snap for novices, er, rugged outdoorsman, a snap, even in the dark. Jackets and sunglasses may be common car company-wear, but Porsche taps in to its racing heritage by offering these $299 918 Spyder racing-style shoes that should help bring out the wanna-be 24 Hours of Le Mans winner in every Porsche owner or those who aspire to become one. 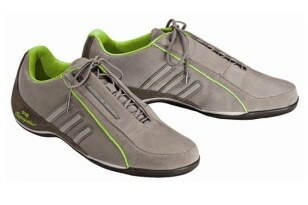 The shoes may not make you a better driver, but surely you will feel like a better driver in them!